The beautifully serene landscape of the Lao People's Democratic Republic. Experience an incredible country covered in lush tropical jungle, sprinkled with waterfalls, and full of rice paddy fields. 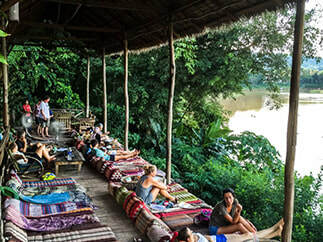 Relax and unwind, surrounded by elephants and temples in peaceful, Luang Prabang, hang out with the Gibbons in, Huay Xai, or go tubing down the river in, Vang Vieng. Laos is the perfect mixture of wildlife, entertainment and culture, with breathtaking terrain to match. 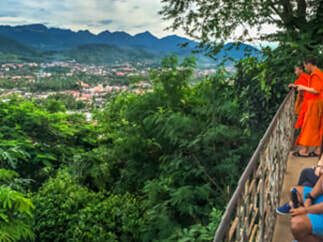 Mount Phousi is a local religious site and a highlight of UNESCO listed, Luang Prabang in Laos. Ascending the 100m high hill located in the commercial centre of town provides a stunning, sweeping view that does not disappoint. 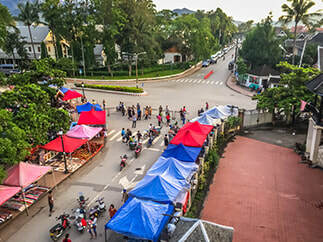 Lined with both market and food stalls, the Night Market is a top attraction in Luang Prabang and is always busy with locals and tourists. Walking through the stalls you will find something very unique sold at this market. 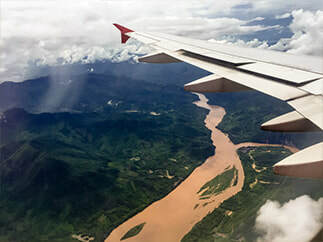 Flying over the jungle on arrival into, Laos on AirAsia flight 617. My eyes were focused solely on the scenery flying over this incredible country. The luscious, dense, jungle creates a serene landscape making Laos a sight for sore eyes.